What began as an indie mobile game in 2014, Five Nights At Freddy’s has grown into a multimedia franchise with multiple games, novel adaptations and a feature film currently in progress. The series is produced by Kiev, Ukraine-based GoldenLane Studio. One particularly challenging scene for GoldenLane co-founder Roman Maltsev was playing two characters named Zoe and Ellis that kiss. Led by Maltsev (along with Alex Portman and Oleg Smolyaninov), the studio’s Five Nights At Freddy’s YouTube video series relies on the iPi Soft markerless iPi Motion Capture software for reliable character animation. Maltsev noted that among the key benefits of using iPi Motion Capture (in conjunction with a Windows PC running on an Intel Core i7 8700K processor and Nvidia GTX 1080Ti graphics card) is not having to rely on expensive green-screens and motion capture suits, and that animations can be exported into either SFM (Source Filmmaker’s proprietary format) or the more universal DMX format, to ensure a quick post production workflow. The motion-capture tracking and design process begins at GoldenLane with a rough pre-visualization, without animation and lighting. All characters are first created in T-pose, a standard default shape for humanoid game model content creation, to understand where action is going to take place, character placement, etc. Following, iPi Motion Capture is used to record and track motion to the previs scenes and then transfer to each character. Although Maltsev is currently the only actor featured in the video production, should that change, the capabilities in iPi Motion Capture (Pro version) provide tracking features of up to three multiple actors at the same time without the need for manual sync. The Five Nights At Freddy’s mobile game series is centered on the story of a fictional restaurant named Freddy Fazbear's Pizza, a pastiche of restaurants like Chuck E. Cheese's. 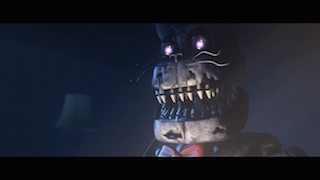 The game involves the player working as a nighttime security guard who must use several tools, most notably security cameras, to survive the night shift against animatronic characters that become homicidal after-hours. GoldenLane borrows from the basic premise of the original Freddy’s series, but introduces new characters, settings and scenarios, such as the hazmat team investigating the dilapidated state of the Freddy’s restaurant; or the wandering traveler who is stalked by one of the animatronic characters. According to Maltsev, the original characters he creates run the gamut from those that will appear only once, to more nuanced ones that will inevitably play important roles as the series develops. For Michael Nikonov, founder and chief technology officer at iPi Soft, the company remains committed to motion tracking software development that delivers exceptional processing speed optimization and tracking accuracy.